Every Sunday during Down Syndrome Awareness Month we’ll be taking a look at how a particular movie(s) portrays a piece of our community’s history. 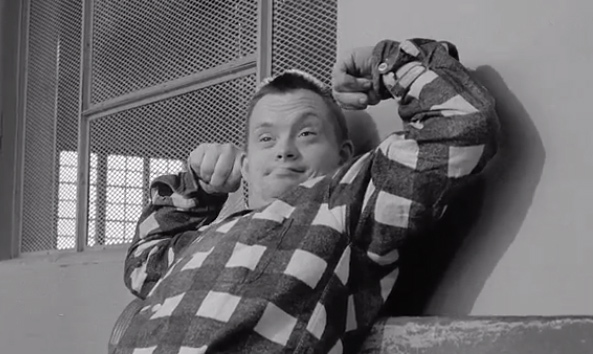 To start us off, we’ll look at how two films, one narrative and one documentary, portrayed institutional life of people with intellectual disabilities. In 1963, two of Hollywood’s brightest– Burt Lancaster and Judy Garland – starred in film called A Child Is Waiting. Lancaster played Dr. Clark, the head of a “modern” institution for “defective” children. Ms. Garland’s character, Jean Hansen, comes to work at the institution and becomes emotionally attached to one of the children, providing the conflict in the story. While the stigma and outdated beliefs are easily spotted compared to today’s information, the theories and teaching methods were considered contemporary at the time. 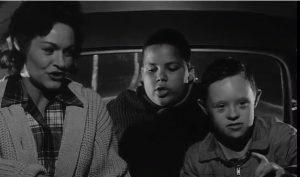 But top honors go to … the group of actual retarded children who appear uninhibitedly in this film. To them and to John Cassavetes, who directed them with notable control — and perhaps to these children’s real-life teachers, who must have helped him from close by behind the scenes — we must be thankful that what might have been harrowing and even distasteful beyond words to behold comes out as a forthright, moving documentation of most unfortunate but hopeful youngsters in a school. From the graphic accounts of how their teachers treat them and train them, how the rule of firm, realistic and unemotional discipline is preserved, and from the simplifications of theory that appear in the dialogue, one should learn a great deal from this picture—all of which should be helpful and give hope. One of the most telling scenes comes when Dr. Clark tries to convince outsiders that his institution and methods deserve funding. This scene, or something like it, still plays out in conference rooms across the nation every day. But while the institution in this film may seem stifling to us, it is a haven compared to what Robert Kennedy found in Staten Island, New York just two years later. In Willowbrook: The Last Great Disgrace, Geraldo Rivera used film to expose the deplorable conditions that existed in this particular institution and ended up impacting the lives of people living in similar places nationwide. As a parent, it is difficult to watch either of these films and understand how our entire society was convinced that these places were, not only necessary, but the best option. We watch these films, not to place judgement on the parents of that time for believing what the so-called experts told them, but rather to be informed about how the best intentions can sometimes go so wrong. Put yourself in the shoes of the parents of Willowbrook patients. Imagine how it would feel to find out what was really going on in there. There is a follow-up film that talks to some of the families 25 years after the expose was released. Unforgotten is the perfect title for this film. We need to make sure that they never are.